The South African Students’ Organization (SASO) emerged as a unique group that re-established opposition to the South African government’s apartheid system "aboveground," as opposed to other black resistance movements that previously had been forced to operate underground. Until the creation of SASO in December of 1968, there were neither black student groups nor black political organizations that were legally allowed to exist. Consequently, SASO filled both of these voids. Its members were actively involved in student politics but it also acted as a political organization addressing critical national issues. After the Pan Africanist Congress (PAC) and the African National Congress (ANC) were banned by the South African government in 1960, most political activity was left to the National Union of South African Students (NUSAS), an organization that included students of all races. Yet NUSAS was prohibited from activity in the nation’s black universities since government authorities mandated that organizations were to be organized according to race. Even after the establishment of a radical group called the University Christian Movement (UCM) which had a black majority, the white members still maintained leadership and established its views. 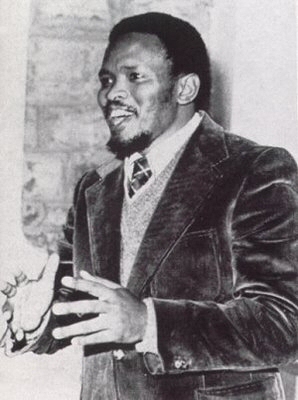 It was at a UCM conference where a group of black students, including Steve Biko, formed a group, which later led to the final formation of SASO in 1968. Within its first few years, SASO created a number of projects aimed at black student concerns but which also involved the general African population. The projects, which promoted and emphasized black identity, ranged from addressing health problems to developing a literacy program. SASO’s underlying message in these projects centered on black solidarity, the idea that the African majority would unify to effectively challenge apartheid and gain full citizenship. Thus SASO embraced the philosophy of “Black Consciousness (BC),” which claimed that whites, however sympathetic to their struggle, could not be a part of the liberation of blacks. That process had to be waged by the African majority under its own leadership. By the early 1970s SASO began to bring together other black organizations, and in 1972 created the Black People’s Convention as the political organization that would promote the Black Consciousness Movement (BCM) across South Africa. Eventually SASO was banned by the South African government on October 19, 1977. When on February 2, 1990, the South African government lifted the ban on all organizations that opposed apartheid; the Azanian People’s Organization (AZAPO) emerged as the group that most prominently embraced SASO’s Black Consciousness philosophy. D.A. Kotze, African Politics in South Africa 1964-1974: Parties and Issues (Pretoria: J.L. Van Schaik, 1975); Mokgethi Motlhabi, Challenge to Apartheid: Toward a Moral National Resistance (Grand Rapids: William B. Erdmann's Publishing Company, 1988). B. Erdmann’s Publishing Company, 1988).